Was proud to present Janice McCord of Abbeville with one of the SC Women’s Leadership Council’s “Women of Distinction” awards yesterday at the Lace House on the Grounds of the Governor’s Mansion. 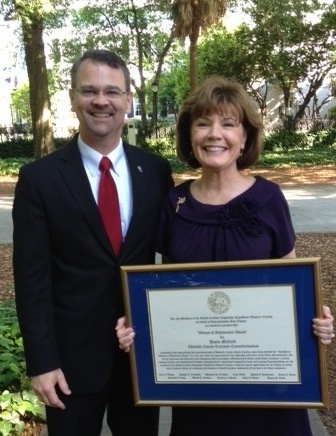 She has been a tireless worker for the State and especially the people of Abbeville for many years. Congratulations, Janice! This entry was posted in Uncategorized and tagged Janice McCord, Lace House, SC Women's Leadership Council, Women of Distinction. Bookmark the permalink.